2018 was a year of surprises. I said it in my retrospect article regarding the music that was released last year, and I am saying it again about this movie. Just wow! It was definitely one of the best movies of the year for me (I mean, “Avengers: Infinity War” was pretty awesome as well) but also one of the best biopics I have ever seen of any rock band out there, and I have seen my fair share of such movies. And Rami Malek’s portrayal of Freddie Mercury is simply brilliant. The movie sets out to depict both Freddie Mercury’s personal story as well as Queen’s history, and this is the point that many people missed out on (at least based on what I’ve read so far). You would think that “Bohemian Rhapsody” is all about Freddie’s life, his homosexuality, wild parties, and battle with AIDS, particularly, but it’s not, and it shouldn’t be. The movie does touch on those subjects, but it doesn’t spoon-feed everything to the public. The way I see it, it’s about Freddie as much as it also is about Queen because you cannot have one without the other, not really. These two aspects should be, and actually are, in balance. Indeed, Freddie’s personal story is a very compelling one, but if you were to focus only on his lifestyle, you would leave out the legacy of Queen, and, let’s face it, most people know him for his music. I am glad the movie didn’t go down that road and deliver what could have been a parody of Freddie’s life, but instead honored his craft and passion for music, above all else, in a very classy and stylish manner. And the quote at the beginning of this review is just about that – “Bohemian Rhapsody” is not just about Freddie, it’s about Freddie and Queen, and their music. Now that we’ve cleared up that bit, let’s talk about the movie in itself a bit. 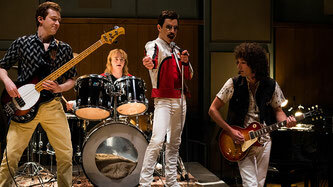 The core of this biopic is, as I said, Queen’s music and seeing how certain songs came to be is really fascinating. “Bohemian Rhapsody” actually focuses on some key moments in Queen’s history from their inception in 1970 until their majestic performance at Live Aid in the summer of 1985, at the peak of their career. What is really interesting to see is how Freddie’s vision and boldness has shaped their success and subsequently the rock scene. Just watch carefully the creation of the song “Bohemian Rhapsody” and how it was received by the label (Mike Myers is amazing here), as these two scenes depict, on one hand, creativity and originality at its best, and on the other hand, stereotyping and boxing everything into categories that ‘work’ for the public. It’s also very neat to see how iconic songs like “We will rock you”, “Another one bites the dust”, or the video for “I want to break free” came to be, but most importantly how each member of the band contributed to their overall success. And some people might not know this, but all four members of Queen wrote songs that later became hits. Just to give you an idea: Freddie composed “Bohemian Rhapsody”, “Killer Queen”, “Somebody to Love”, and “We are the Champions”; John Deacon wrote “Another one bites the dust”, “Friends will be friends” (one of my favorite songs), and “I want to break free”; Brian May composed “We will rock you”, “Who wants to live forever”, “Hammer to fall”, “The show must go on”, and “I want it all”, while Roger Taylor wrote “Sheer Heart Attack”, “Radio Ga Ga”, and “A kind of magic”. That’s how versatile and creative they were both as a band and as individual artists, and the movie does a great job of capturing these moments as well as all the different dynamics within the band at certain times. If the core of the movie is the music, the heart and soul of the movie is Freddie and his relationship with Mary Austin. It’s lovely to see how that deep bond they both shared has developed over the years, and turned from love into everlasting friendship, which is something that not many of us get to experience in our lifetime. Both Rami Malek and Lucy Boynton did a wonderful job playing those scenes with candor and affection. Just the scene in which Freddie tells Mary about his sexuality (with “Love of my life” on the background) is both heartwarming and heartbreaking at the same time. Another one that I really liked is Mary seeing Freddie play Live Aid, and the range of emotions that was shown during that sequence. Apart from that, Freddie’s relationships with Paul Prenter and Jim Hutton (especially that after-party discussion) are also beautifully portrayed and just show Freddie’s human side, so to say. The film doesn’t focus only on Freddie the performer and his success with Queen, but also on Freddie the man, with his struggles, turmoil, and inner workings (I love seeing this duality), and Rami Malek did a wonderful job of bringing both sides into focus. The cast was very well chosen and did a phenomenal job, each and every one of them. Everybody is in agreement when talking about Rami Malek’s outstanding performance, from critics to fans alike, nothing but praise upon praise for the way in which he brought Freddie to life. 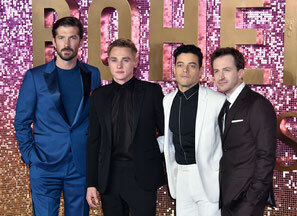 But then again Joseph Mazzello (as John Deacon), Ben Hardy (as Roger Taylor), Gwilym Lee (as Brian May), and Lucy Boynton (as Mary Austin) are just as brilliant and wonderful in their respective roles. Even if “Bohemian Rhapsody” is marked as a biopic, and a celebration of the band’s musical legacy, it’s not a documentary, so in this regard some aspects of the storyline are not 100% accurate to the band’s actual timeline, and there is some dramatisation of certain facts to fit the plot better. But don’t let that stop you from enjoying this movie for what is it. 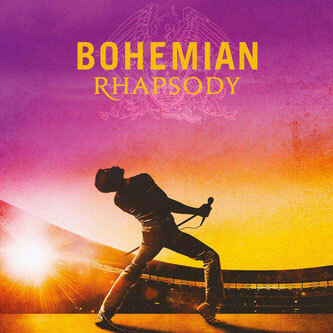 Based on a well written screenplay and acted out superbly, “Bohemian Rhapsody” is a roller coaster of emotions that will have you singing along to the hits, but also shedding a few tears during more intimate and candid moments. Really worth a watch, or two.